The couple wanted a kitchen that would allow Gareth, who is a professional chef, to experiment with recipes, plus a more practical layout with plenty of storage space for all his cooking equipment. They had set their heart on a traditional painted Shaker-style kitchen to complement the high ceilings and period features of their Georgian home – and chose the company to supply it five years ago – but were unable to raise the funds. However, Helena then discovered she was pregnant. Helena and Gareth admit they hadn’t really considered how the new layout might impact on the practical use of the kitchen. Their kitchen designer, Enrico Roncaglia of John Lewis of Hungerford, showed them how to create the perfect layout by starting the design from scratch. His simplest suggestion, which would make a big difference to the existing space, was to hang the kitchen door from the opposite side of the door frame. This meant they would be able to walk directly into the space, rather than it being hidden by the door as they entered. Keeping a close eye on their budget, the couple didn’t plan on relocating the gas and water supplies, but one major redesign change involved moving the sink and plumbing to a different wall, separating it from the main cooking area. Helena and Gareth were concerned that the new position of the washing machine and dishwasher would be next to the baby’s cot on the other side of the wall in the nursery. They also thought the wastes might not have enough of a fall underneath the floor to be able to exit the building above the level of the drain, in which case they would have had to add a noisy pump to the system. The couple had the falls for the waste checked anyway and found that a pump wasn’t necessary after all. ‘He was right – I’ve since stood in the nursery with the washing machine and dishwasher on in the kitchen and I could barely hear them,’ says Helena. Enrico also suggested re-opening a fireplace to house a new range cooker, with a mantel above to match the units plus a traditional tiled splashback. However, after pulling off part of the plasterboard that covered the chimney breast, the couple discovered that the opening wasn’t even big enough for a small wood-burning stove. 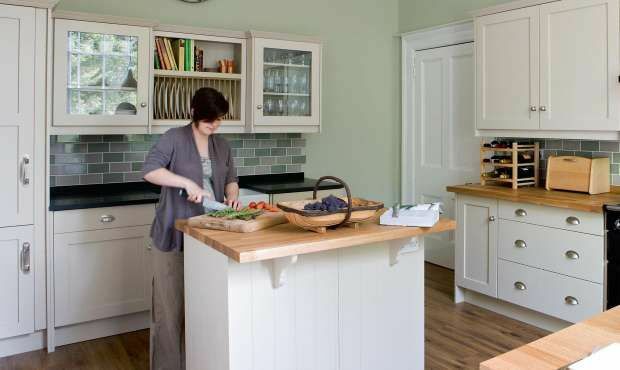 Helena and Gareth wanted olive green painted walls and thought a warm neutral shade on the units would suit the oak worktops they had their eye on. Once the colour scheme was chosen, the couple turned their attention to the flooring, choosing an elegant oak-effect vinyl because it would be low-maintenance and lightweight – perfect for when their new baby reached the toddler age. The original kitchen had been poorly lit with only a strip of spotlights, so they introduced a variety of zoned lighting sources, including directional dimmable spotlights on wire tracks strung above the food preparation and sink areas, with discreet LED undercabinet downlighters over the worktops and inside the glass-fronted wall units. A retractable pendant above the dining table varies the mood at mealtimes.